When you drop a few drops of oil on the skin of theneck of the dog, they diffuse into the blood. It is better to avoid essential oils photosensitizing, allergenic, dermocaustiques, and so general, is better not to apply on the sensitive mucous membranes (around the eye, nose, lip, ear, area perinetale, etc.). Vegetable oils soften the aromatic aggressiveness of some essential oils and bring their own qualities (vitamins and essential fatty acids). You can use the eyes closed those sweet almond, olive, peanut, corn, grape seed (without smell, but become rancid unless it adds a little wheat germ oil). Then, there are more expensive but interesting oils for their regenerative properties: wheat germ, Hazel, St. John’s wort (antalgic, healing), Calophyllum…I admit to having a preference for those of macadamia and hazelnut, whose fluidity allows a quick penetration and leaves no fi lm fatty skin, hair and… the cushions. Important : should a dilution of 10-30% essential oil. For example, a drop of essential oil for 10 drops of oily excipient. Use only a few drops of the mixture. For easier application, the healing plant principles may be included in creams, ointments, gels, excipients with petrolatum-based, and even in Green Clay for the poultices. I like to use a neutral cream as the Dexeryl, which I will be charged a nuts before adding a few drops of essential oil. Prefer neutral, or even alkaline formulas. 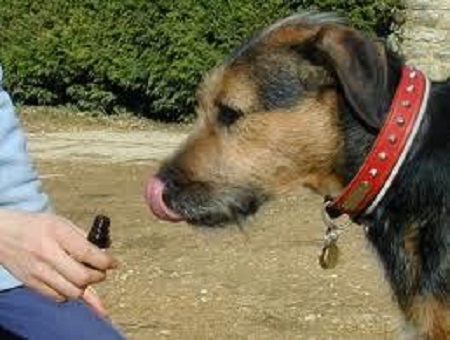 For pest control action, pour 60 drops of essential oils of lavender and geranium for a 200 ml bottle. Shake well before use. This combination reduces the smell of the oil. It brings increased honey-specific properties: balsamic, emollient and antiseptic. Liquid honey: 7 to 8% of essential oil; creamy honey: 15-25%.The essential oil by oral administration. Charcoal, neutral lactose compressed, compressed chlorella or spirulina (these last two are very rich in minerals, vitamins and amino acids). Aggressive oils mucous membranes (cinnamon, thyme thymol, etc.) must be mixed with an excipient which protects them. Coat the kibble for dogs with a mixture of a few drops of essential oil in a little vegetable oil. For fresh food, can be put directly 1-3 drops into the bowl, but not more! Also in a Meatball. It increases the palatability of the preparation and is an energy source for a sick animal.Airway… It is also possible to distribute the oil in the atmosphere (stress, bronchitis, kennel cough…).